Why You Need Them: This package contains all the basic business forms you need to start or upgrade your house cleaning business. They provide credibility for your business, tracking so you can accurately assess your business results, client tracking to monitor houses that are costing you money are the most important reasons you need these forms. Highly recommended to track your operating variables so you have the statistics when you decide to hire workers. These forms contain important information to justify your rate increases for each affected client. These forms are included in the Business-in-a-Box system – Save with the bundled purchase! House cleaning business forms should provide you with more value than just a form to leave a record for your client. Did you know they can provide you with valuable information to grow a house cleaning business? You see – house cleaning business forms should record the information you need to keep your clients happy. If not, you’re just wasting your money. That’s why I created custom forms for my residential cleaning business…I couldn’t find any existing business forms that allowed me to track the information I needed to evaluate worker performance and the quality of the work they did for MY clients. Launch your house cleaning business to the next level. This is a one-time investment and a valid business expense and tax deduction. These forms are unique because they contain critical information needed for running your home cleaning business. If you need to raise the rate on a house, the information you need to justify the increase to your client is on your business forms. Residential house cleaning clients don’t want to be locked into cleaning business contracts. Instead, I used a cleaning services agreement that I also used as an estimating form. Use it to record your notes during the estimating process and to discuss your terms while meeting with your prospect. This form can also be used to provide a phone quote and follow-up. 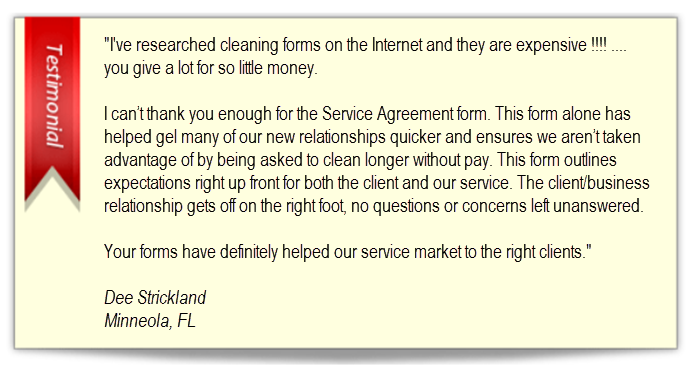 The Service Agreement contains the most needed terms of service for a house cleaning business. These may be changed as needed for your business. This is a 6-page form with instructions for use and customizing. Use this cleaning checklist when meeting with your prospect to discuss the cleaning tasks you perform. Then leave it with your prospect even if they don’t schedule an appointment. This is my “trick” for getting prospects to call me back even after they meet with other businesses. After all – they have my printable cleaning checklist to refer to and compare with my competition! The cleaning service checklist you leave with your client on each appointment. This is also saved for your client file and allows you to analyze work performance. Choose to use the full size or the half page size to save on ink and paper. The cleaning invoice with important information for your client. One of the most important house cleaning business forms for your business. If you don’t use a work order template or if you don’t use it correctly, you may fail to keep your clients happy! This custom editable work order template is the key to your success to grow a house cleaning business when you hire workers to do the dirty work. You can customize the referral coupon yourself with photo image software such as PhotoShop or by using a service like PicMonkey or Canva. We provide the step-by-step directions, but customization is included with your purchase. You can customize this flyer yourself with photo image software such as PhotoShop or by using a service like PicMonkey or Canva. We provide the step-by-step directions, but customization is included with your purchase.